Hobie Surf :: The Surf Swap and Sale is Back!! It’s Back!! Our annual Surf Swap & Sale at our Dana Point Hobie Surf Shop (only, in Dana Point!!) is set to go off this Memorial Day Weekend! We LOVE this sale!! It’s our chance to not only help you clean out those used surfboards in your garage, making room for a whole new rack of boards… but it’s our chance to buy those used boards off of you and have a brand new, though slightly pre-loved, quiver of our own! You set the price for your boards, with a little help from us, and when it sells, 10% of the selling price will be donated to Surfers Healing (see video below to learn more about this incredible organization)! Be wise in your selection of boards to bring down, surfboards 7’6″ and over sell the fastest and usually for the best price. SUP’s also do well at the swap, but as far as shortboards go, it’s hit and miss on how they fare. We also have had a strong turnout of folks looking for classics and vintage boards, too! Remember, cleaned up, unwaxed boards look the best in the racks. You want your girl to stand out amongst the sea of other boards, so shine her up nice and pretty! 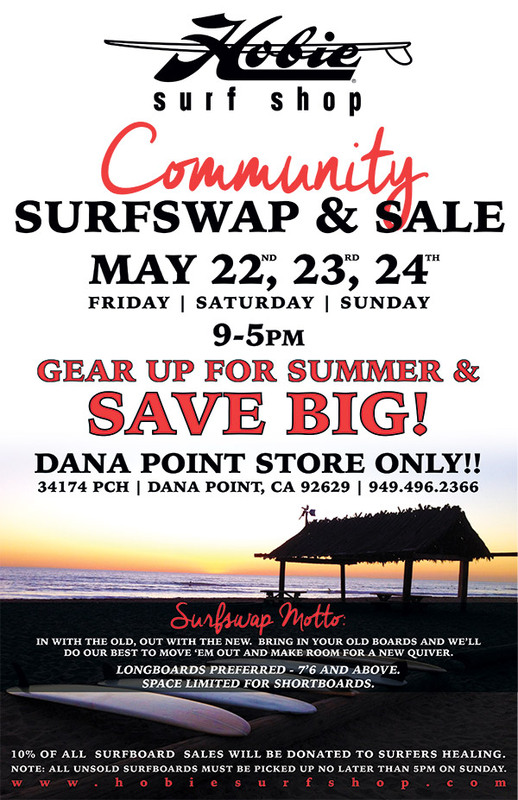 Tell your friends, and especially tell that board hoarder you know, to bring their boards on down to our Dana Point Shop (again the sale is only at the Dana Point Shop) bright and early on May the 22nd. We will start taking in boards as early as 8:45am. When you fill out your forms, make sure to give us an easy phone number to reach you at, just in case we have an offer on the table that you want to hear. We have seen people come up cash in hand, looking to get a bit off the marked price only to leave when we can’t get in contact with the seller. Price your boards fair and be willing to STOKE someone out on a new ride! It’s crazy fun to watch people find the new log of their dreams at a price they can afford! Stop in through out the weekend and see how your boards are selling, and make sure you shop the SALE! We go BaNaNaS marking items down!! Our outside parking lot will be full of great deals, and we’ll have special markdowns inside too! Seriously, you will Not be disappointed with this sale and swap! Make sure you are ready with phone in hand on Sunday May 24th around 3:30ish, just in case we didn’t sell your boards. You will have to pick them up again that night by 5pm. But, trust us, we do our best to sell them all!! Ok, if you have any other questions, call our Dana Point Shop at 949-496-2366, otherwise, We’ll See You at The Swap!!! This entry was posted in General and tagged bonzer, classic surfboard, community event, Dana Point, funboard, Hobie dana point, Hobie sale, Hobie Shop, longboard, me, oral day sale, orange county, sell used surfboards, surf swap, surfboard, twin fin, vintage surfboard. Bookmark the permalink.